Alaska Salmon,Trout & Halibut Fishing Information ! targeting Alaska's famous salmon and trophy rainbow trout. Note that each of the 5 salmon species in Alaska have two different names for some reason. for catching the monster of your dreams !! The rivers and bays of Alaska are world famous for producing giant trophy King (aka Chinook) salmon. The world record was taken in May of 1985 weighing 97 lbs. 4 oz. on the Kenai River of Alaska. Every year sees thousands of kings weighing between 30 and 80, even 90 lbs. entering Alaska's rivers. Their fighting strength is legendary, and those that have battled these giants have memories that will last a lifetime. 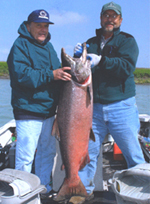 Alaska king salmon fishing is typically best from mid May through July. Methods for taking Kings include back bouncing, back trolling, and drifting from boats, although they can also be taken from the river banks on occasion. Saltwater fishing for kings by trolling actually occurs year round in various parts of the State. These silvery fighters average 6-12 lbs. and most of its muscle. 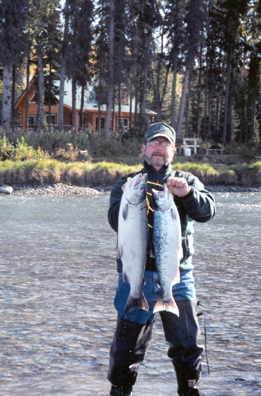 These salmon begin to clog the Kenai and many other rivers in mid June and the runs end usually in mid August, although in some places they are still arriving in good numbers even into late September. Since the Sockeye tend to hug the bank, most fishing is done from the shore. 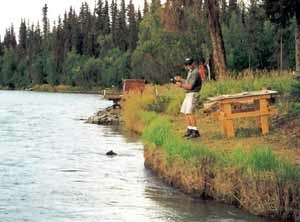 Methods include casting cohoe flies with a fly rod or spinning rod in a style found primarily on the Kenai River. Although they have been known to hit spinners and even bait, using flies is still the best bet. 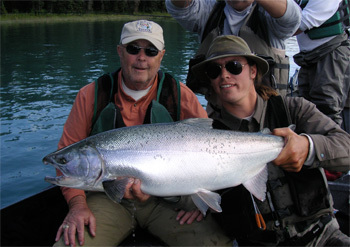 Many anglers think silvers are the most fun of all the salmon. These fighters are notorious for their acrobatics, burning up drags and snapping rods. Silvers average 10-14 lbs., with lunkers sometimes over 20 lbs. Seasons begins in July and end in October depending on the area. Fishing for silvers is popular in both fresh and saltwater with various derbies being sponsored by local communities. Methods include casting spinners, back bouncing, and back trolling. Ask about the Seward Silver Salmon Derby- this salt water fishery is in mid-August, has a six fish limit, non-stop action, and takes place in beautiful Resurrection Bay. Valdez and Kodiak also have silver debies in the saltwater. Silver salmon fishing in the rivers of Alaska is also great fun with a fly rod and flash flies or egg sucking leaches. Silvers also like Vibrax spinners. Green being this writers favorite color. A trip to Alaska is not complete without adding trophy rainbow trout to your fishing trip agenda. While some sections of some rivers are fly-fishing only areas, rainbow fishing is allowed in many other areas by other normal fishing means including the use of spinners and/or bait. 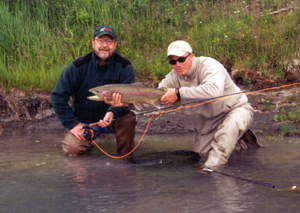 Some of the best trophy rainbow fishing is found from the fly out lodges of Southwest Alaska in the Bristol Bay area. 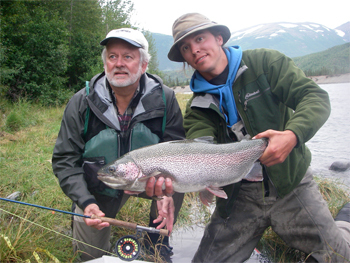 However trophy rainbows are also caught in most other rivers of Alaska including those on the Kenai Peninsula. For trophy rainbow in the 7 to 15 lb range, we do recommend booking with a lodge or a professional guide. Pacific Halibut: Almost all Alaskan saltwater is home to some of the finest halibut fishing available anywhere. 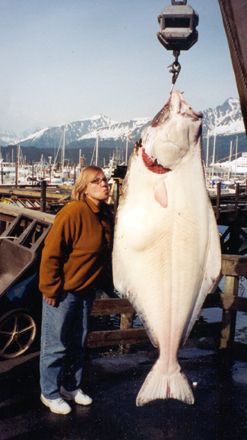 Limits of halibut weighing between 20 and 50 lbs. 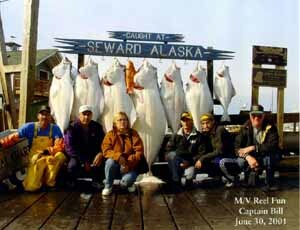 are the norm, with halibut between 100 and 300 lbs. coming in daily. 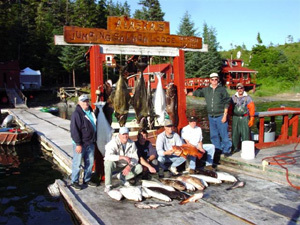 Many fine Alaskan lodges specialize in halibut fishing. Halibut trips can originate from most towns in Southeast Alaska, Kodiak, and the towns of the Kenai Peninsula including Ninilchik, Homer, and Seward, with every area having its unique advantages: lodging accomodations, boat size, trip length, travel time, and scenery. 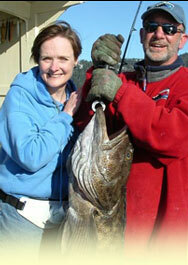 Combination trips fishing for King salmon and Halibut are very popular saltwater trips. Halibut fishing runs from May through September with King-halibut combos having the greatest catch rates in June and July. Returning in even numbered years in late July through August, Pinks are the single most aggressive salmon that returns to Alaska. Their sheer numbers and willingness to strike anything shiny makes them a favorite with kids, novice fishermen, and anyone who fishes for the thrill of the catch. Best when taken fresh from the salt water, Pinks have a delicate white flesh that looses its texture rapidly once they enter fresh water. Caught by casting spinners and spoons. Saltwater fishing for various species of bottom fish, including rockfish, cod, snapper and more can be caught while halibut fishing from Alaska's lodges and charters. The waters of Southeast Alaska, Kodiak, Katchemak Bay and Prince William Sound are truly a pristine wilderness wonderland, with many species of fish and wildlife to observe. Many of the areas fished are protected waters, bays, inlets, and passages. In the saltwater, fishing for Halibut, Salmon Shark, many forms of rockfish (red snapper, lingcod) and many other species can be done all on the same trip, while fishing for all 5 species of Pacific Salmon, is more seasonal. Please see the above. Try your hand at catching some virtual Alaskan fish: Click on the link below and see how many fish you can catch. 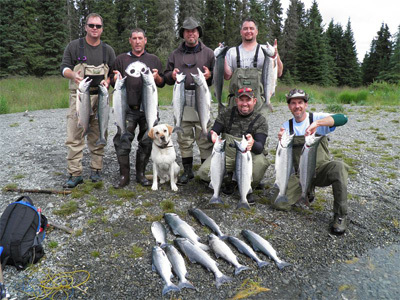 Alaska Sport Fishing, including freshwater and saltwater fishing for King (chinook) Salmon, Sockeye Salmon, Silver Salmon, Rainbow Trout, Char, Northern Pike, Halibut and more.